During an emergency, lack of preparation can have a devastating impact on any organization. Confusing messages, uninformed staff, and disorganized leadership can put people in harm’s way, slow down response time and make it more difficult to get operations back up and running. Natural disasters, terrorist attacks, and other disasters need to be taken into account when an organization is developing a safety plan. The importance of emergency preparedness cannot be overstated. Every organization has a duty of care they are obligated to fulfill. This means that organizations have plans and tools to help keep people safe and informed about potentially dangerous situations. Organizations that plan, test and train for these events see the benefits in a number of ways. In this blog post, we’ll outline several advantages to disaster management and provide some examples of how to prepare for different emergency situations. Cataclysmic events such as earthquakes require intense planning to facilitate an effective response. While most people know that earthquakes are measured using the Richter Scale to understand the intensity of the ground shaking that occurs, but there is another scale that provides a more relative measurement based on where the earthquake occurs. The Mercalli modified scale offers advantages when understanding earthquake intensity because it takes into account factors like damage to structures. This can be helpful for large cities in areas prone to emergency situations often make emergency preparedness a priority. Take, for example, the Seattle Disaster Readiness and Response Plan. This kind of detailed document helps officials and citizens understand the procedures for preparing and responding to a crisis situation. Making comprehensive plans ahead of time and running earthquake drills like the Great ShakeOut helps people understand what actions they need to take to stay safe. Large-scale emergencies can result in a state of emergency being declared by a government entity. This can be an important part of emergency management and the benefits of a state of emergency often include opening up resources that will benefit communities impacted by the emergency situation. As mentioned above, lack of preparation can hinder an organization’s ability to get back up and running. When disaster strikes, an organization that has not done the proper preparations is left in a vulnerable state. The benefits of emergency preparedness can include: understanding situations an organization is at risk of encountering, developing messages that inform people of emergency situations, determining who is in charge of sharing information, knowing what channels will be used to disseminate information, and designating safe areas. Each of these components combines to provide organizations with an emergency response plan that can be deployed quickly, shares valuable information and keep people safe. We offer a number of eBooks with valuable information, including how to communicate clearly during an emergency, using emergency notification systems for natural disasters and more. 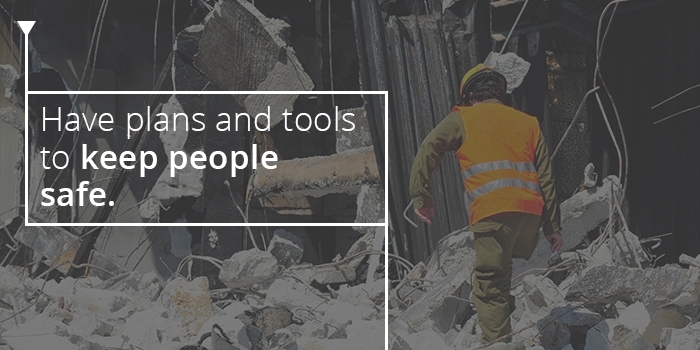 Download these resources and more so your organization can begin seeing the benefits of emergency preparedness.